Hello everyone. Its another morning, dark and chilly, here in New Hampshire. Yawn. I could sleep in again this morning. I think this waiting for my husband's surgery, along with work demands, are getting to me. I could use a day off just for me right now-well actually I could a vacation, but its almost the weekend. And no kids tomorrow as we have a teacher work day. Yahoo and big smile! So my journal page today is all about wanting that low key relaxing kind of day. Its not very complicated but these are my slippers- and yes they have owls embroidered on them. I was inspired by a comment Patty at Magpie's Nest made the other day on her blog. She talked about instead of walking around in the house barefoot it was time to pull out the slippers. That's me for certain, and especially this week since its gotten chilly. Never mind I have been so wiped out and sleepy the last couple of days. I sketched the slippers, stamped and colored the owls with markers. Then I painted the base of the slipper and used molding paste to make the fleece on the inside. But the good news this week is they finally turned the heat on in school (my large cavernous class room has finally gotten over 61 degrees F (16 Degree C), and I got my hair done and I really needed my hair cut so I feel better. Hey, its that kind of week. Got to make the best of all the little things. OK, that's all for me. Time to get ready for work. Its a wonderful page, seeing the slippers makes me feel warm and cozy just looking at them. Hope you have a relaxing weekend. I simply ADORE those awesome slippers. They look good enough to snuggle into. 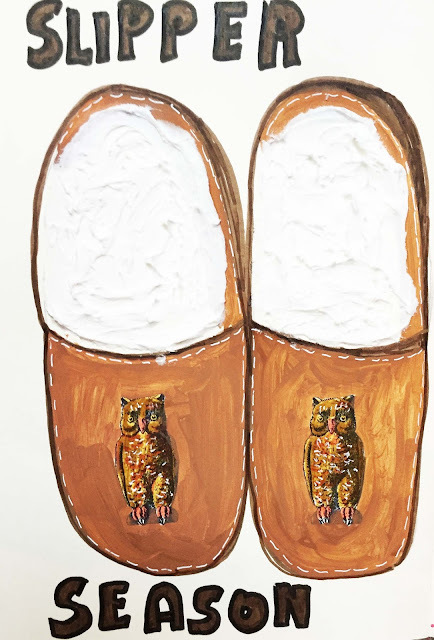 I'm not ready to give up my summer slippers just yet, but it won't be long till I snuggle into winter indoor only slippers like yours (without the adorable owls, of course). I hope Friday is a good, relaxing day for you. You deserve it. Your slippers look fabulous! I just take the same home-slippers the whole year long... in summer without socks and now with warm socks. But maybe I buy another pair soon.. will look if I can find something that fits and looks so nice as yours do. And... I need a haircut as well! Dark and chilly and rainy here as well since three days! Thank you for joining us at AJJ! You're right about the slippers. I've had an on-again, off-again relationship with mine for a few days now. And come this week, I think we might be on again -- full time! Those look like cozy slippers. I'm a barefoot girl even in the winter, but I daresay it doesn't get as cold here as it does there.